Every kid has a dream to live upon a treehouse and hide his or her face behind tree branches. However, most of us are unable to achieve such a difficult dream for build a firm, wide tree house in some beautiful location. Believe it or not, there is actually one place that accomplishes this fantasy. Inspired by the nature, the Yellow Treehouse Restaurant, which offers 25 seats, in New Zealand is a stunning architecture that typically built on an enormous redwood tree for diners to enjoy their dishes while being immersed into the wonderful environment. As the dusk fall, you can also see the restaurant shines like a golden cocoon wrapped up by dark shade. This astonishing architecture is a significant project of a New Zealand based architecture studio – Pacific Environment Architects Ltd. (PEL). Led by architect Peter Eising and Lucy Gauntlett, the team has faced a challenge that they had never met. Their client, Yellow Pages Group, hopes to build a fully functioning restaurant up in a tree for 25 diners and staff and the time frame was very tight. These two architects started to brainstorm and came up with an idea – childhood fantasy. PEL assisted project managers The Building Intelligence Group, Colenso BBDO and Yellow in the selection of the enormous Redwood tree on which the treehouse is to be built. 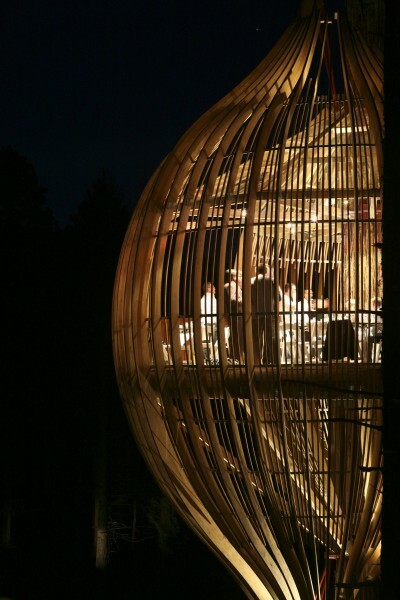 They attempted to search for a perfect position to ensure that the treehouse can be seen even in forest while being able to provide wide and open view when diners sit inside the restaurant. 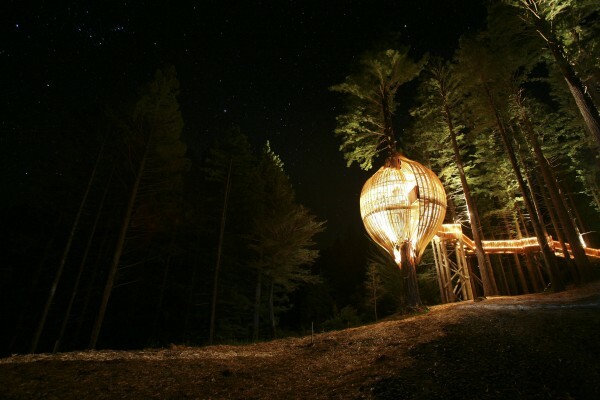 Finally, they decided to build this treehouse at the edge of the forest and lift it up from the ground. They found a tree that is over 40 meters high and 1.7 meters diameter at the base on a site north to Auckland. Since they adopted a special-designed project, the concept proved challenging and encompassed a range of consultants to get both Resource Consent, Building Consent and construction underway in a very limited time, names, around four months. “We’ve never been involved in a project quite like this before!” Eising noted excitedly. 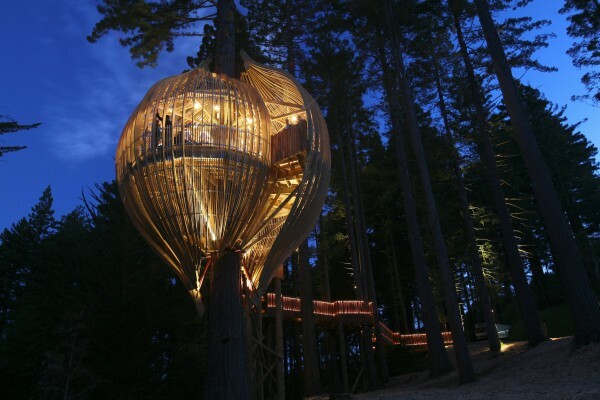 They built the treehouse on a position that is over 12 meters high and the restaurant diameter is almost 10 meters wide, with the split-level floor sitting 10 meters off the ground. 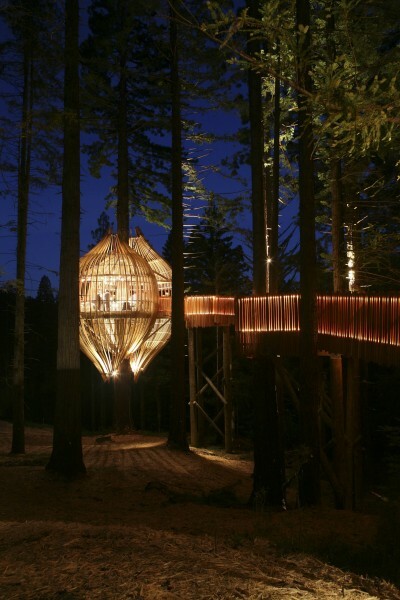 This treehouse can only be accessed via a 60m tree-top ‘accessible’ walkway that also built by woods. Timber trusses form the treehouse’s main structure. The curved fins are glue-laminated pine, plantation poplar has been used for the slats and redwood milled from the site used in the walkway. Openings are formed for windows by leaving spaces between the slats/fins that keeps the overall form yet affords a variety of openness for the views and light and closes down toward the rear. To loosen the regularity of the elements, steel is wrapped arbitrarily around the pod. Tying this up at the top and base has a sense of greater connection with the tree. This is such an amazing architecture so it deserves the perfect light. 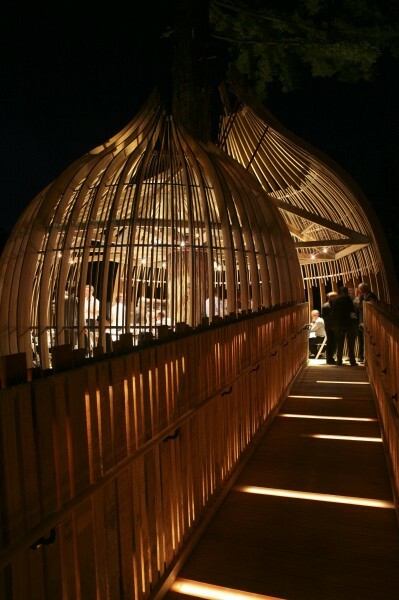 Eising emphasized that “Lighting is an important architectural component enhancing and changing the mood.” They worked with Renee Kelly from ECC Lighting & Furniture to light it up through discreet lighting within the bars of the walkway and up-lighting within the tree house. 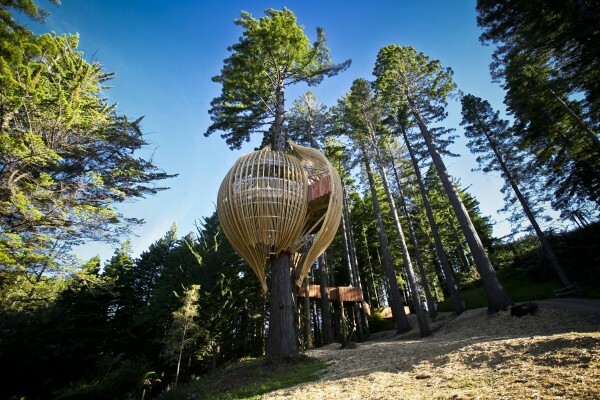 During the day, the tree house appears like a wooden cocoon that hanging on the tree. At night, in comparison, it turns into a shining lantern pop out from the darkness like a beacon. 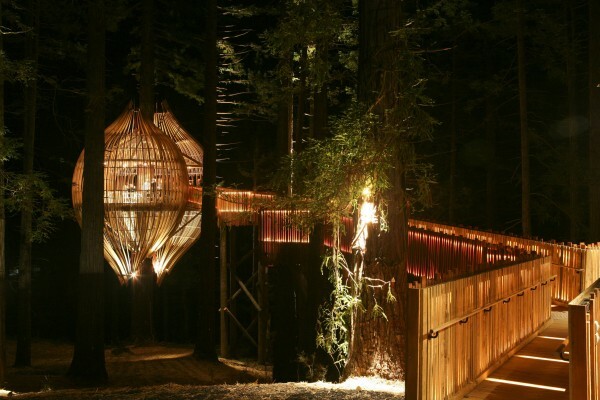 It is not difficult to image how fascinating the treehouse is during the night – when you gaze into it, you may find it a floating fantasy that ever appeared in your dream. Surprisingly, this is not the only treehouse PEL plans to build. They are now working on a baby version tree house titled “In TrePod” and this new project would be presented to the public very soon.